This was a cool project we made for the 909th ARS at Kadena Air Base, Okinawa Japan. 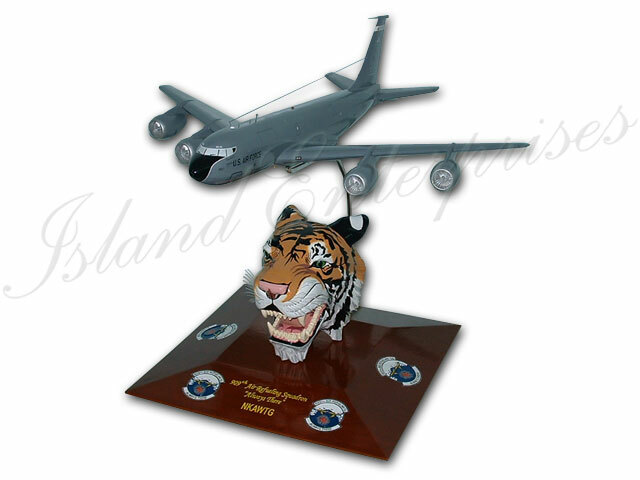 The KC-135R is 36" long mounted with stainless steel bar to a 36" base, with a 3D hand carved and hand painted Tiger Head. This particular project cost around $2,000.00, but your cost would depend on the size and scale of aircraft and how creative you get with the base. AND REMEMBER!!! We offer a 100% money back guarantee if you are not convinced that you have bought the most accurate and highly detailed product available on the market!!! As well as a warranty on our products against warping or cracking.